It’s hard to transition from learning about Public Relations in the classroom and taking what you learn in school to the field. This was especially true for me since at my university we strictly learned and practiced very traditional PR, none of what I practice at a digital agency every day. For all of you confused college kids out there wondering why we’re not contacting our media contacts via the Pony Express like they taught us in school, here are the real tools and tricks you need on your tool belt to succeed in modern day PR. This almost goes without saying, but Twitter is an easy (and free) tool I like to use as an extended researching hub. Reporters, editors, analysts, every human on the planet who wants an extra place to network in a relaxed zone, uses Twitter. Why I use this tool? Twitter is that laid back platform that gives you insight to what a writer or editor really wants. They might not be as transparent about how to pitch them as some of the writers from Forbes or Inc.com are (a letter to pitchers like you and I). The best part? We can see what these editors, outlets and reporters have an interest in to help get that information you might acquire during a networking party, without going to a networking party! *introverted dance*. 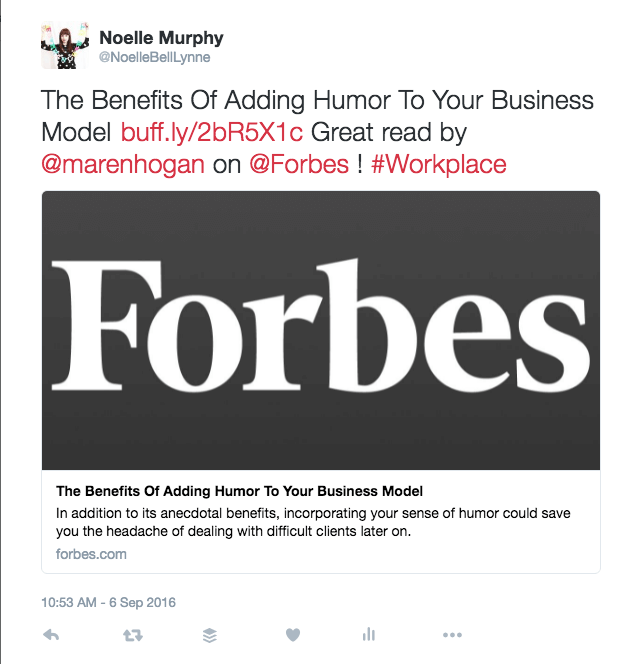 LinkedIn Pulse Tips: If you republish for your clients, please do, you can tweet at LinkedIn Pulse afterward (formatting below) and if they deem your client’s article relevant to their messaging frame, they’ll boost the post. 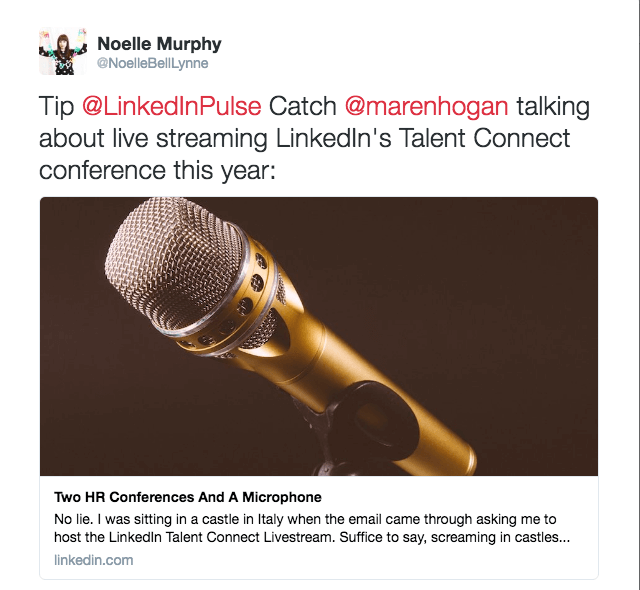 Twitter Chats: There are a BILLION Twitter chats for lots of industries, including PR. This is a great place to learn from professionals in your field and interact with thought leaders in our field. Get your learns on! A genius Google Chrome extension built for little networking bitties like us. 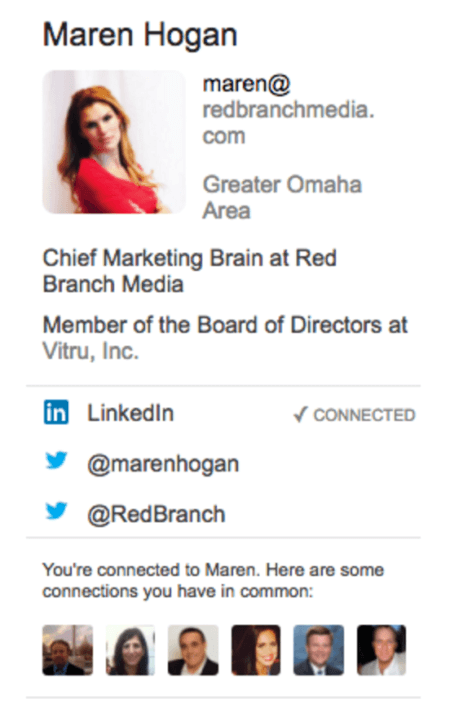 Attach this extension to your toolbar and every time you reach out to a media contact via email, a sidebar pops up in your email platform including a photo of who you’re reaching out to, their title and duties and the option to connect with them on LinkedIn and any additional social accounts they have. How I use this tool: It’s these gentle, harmless tactics like following them on LinkedIn and Twitter and favoriting/retweeting them here and there before, during and after your email outreach that really work. If you’re lucky enough (like me) to work for super nice people who are willing to hear your pitch for why you need paid tools to help you ace your job, Cision is the platform every PR practitioner needs. My life without it before is a life I don’t want to remember! Dramatic? You tell me. THERE’S MORE. I can distribute emails on behalf of my clients, schedule them, respond to HAROs, send press releases, receive detailed release reports *gasping for air* the list goes on. This tool is the base of my success to help me very deeply research my contacts to ensure I’m hitting the right target. Like Jeanne, social media is our most important tool in networking, relationship building and researching with the media. Well, and also, learning not to be a creepy jerk to your contacts. Noelle joined Red Branch Media right out of college and quickly rose through the ranks to shape the Red Branch Media placed and publishing department. If you see an article of ours (or one of our clients) posted on their blog, on another site, in a magazine or anywhere else, chances are, Noelle did that! Her superpower is not getting frustrated when editors don’t email her back. Noelle is the Placed and Published Media Manager at Red Branch Media.